Beats Pill 2.0 portable speaker brings the party with you, wherever you go. 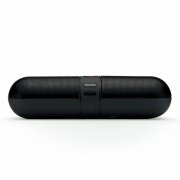 The Beats Pill is lightweight, portable, and completely wireless. Change tracks from your phone or take a call with the Beats Pill’s built-in microphone. New features include the ability to amplify or stereo your music and accessory charging. Small enough to fit in your hand, the Beats Pill surprises with its powerful, signature sound. Tap. Pair. Play. Pairing is easy. Just tap your phone to your Beats Pill and create an instant connection. Sync two Beats Pills by tapping them together to play the same song. You can also tap the Beats Pills together twice to stereo your music, making one Beats Pill the left output and the other the right. Small Size, Big Sound Despite its compact size, the Beats Pill produces powerful sound. It’s easy to enjoy soaring highs and deep, booming bass in every room of the house. Change Tracks From Your Phone Pair the Beats Pill to your phone, laptop or any other Bluetooth-enabled device to change tracks and adjust the volume from up to 30 feet away. Totally Portable The Beats Pill frees you to roam so you’ll always have premium sound, anywhere you go. It’s lightweight and small enough to fit in your bag. If your phone or external device is low on battery power, you can use the Beats Pill to give it some juice. Bluetooth Conferencing Take that call. The Beats Pill’s Bluetooth capability and internal microphone make talking on the phone easier and better sounding than ever before.